The Little Genius Montessori's two year old toddler classrooms had the chance to watch a squirrel eat! 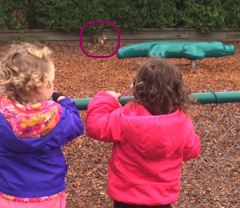 This brave squirrel feasted on a healthy nut snack while the children watched through the fence outside on the playground. While taking a walk with your toddler have them look around for natural encounters. If your toddler spots a bird, bug or some other critter let them observe it for a moment. Ask them questions about the animal they found such as "Where do you think they live?" and "What do you think it likes to eat?" 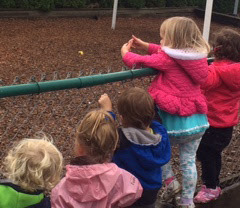 Observing living creatures and thinking about their activities broadens a toddlers understanding of the world around them.